In the NorthEast corner of Balboa Park, between the Natural History Museum and the Zoo, is the Spanish Art Village, a collection of studios of a variety of artists. Inside this village are artists studios of many forms of art - from painting to photography, sculpture, clay, pottery, ceramics, even glass blowing! There are also the Sculptor's Garden, and Gallery 21, with rotating displays of various artists! On the outside on Village Place is the studio of the 'Southern California Association of Camera Clubs. On a weekend afternoon in the Spanish Art Village you can find many of the artist's studios open. Art includes painting, sculpture, glass, pottery and photography. YouTube - art and music! CLICK HERE for some examples of the musical artists that appear! 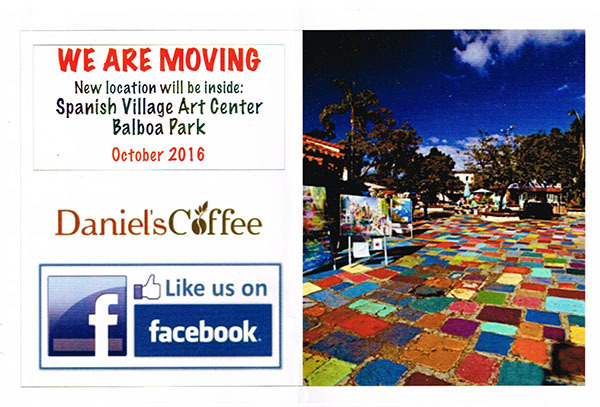 Now in Spanish Village, Daniels' Coffee Cart!